In our workshops, ALBA faculty introduce the participating teachers to our extensive collection of primary-source material and work with them to come up with ways of getting the Spanish Civil War, the history of anti-fascism, and the stories of the women and men of the Abraham Lincoln Brigade into their classrooms. Over time, we have expanded the historical arc covered in the workshops, tracing threads from the conflict in Spain all the way to the present day, passing through World War II, Vietnam, the perennial Oil Wars in the Middle East, the conflict in Syria, and the ongoing struggle for social, racial and economic justice in the United States and abroad. For the first eight or nine years of our educational programs, we would often have to make the case for the current relevance of many of the issues we focus on: fascism & anti-fascism, refugees, interventionism and non-interventionism, internationalism, Human Rights, the working class struggle, etc. And then came the last presidential election cycle and its disastrous aftermath. Suddenly, the sorts of discussions that ALBA had been facilitating with teachers “on the fringe” for over a decade suddenly found themselves in the headlines once again. This change in landscape has led to a drastic increase in the demand for the type of educational outreach we perform. As a result, this past Fall semester was our most active semester ever, and the Spring of 2018 is shaping up to be even more lively. Suddenly, the sorts of discussions that ALBA had been facilitating with teachers “on the fringe” for over a decade suddenly found themselves in the headlines once again. We always knew that the anti-fascist legacy that we work to preserve and pass on is vital and urgent, but we had no idea just how vital and just how urgent it would become in the years immediately following the disappearance of the last remaining Lincoln veterans. Today’s general public, students and teachers included, are hungry to learn about and engage critically with the complexities of the 1930s. And by connecting them with the extraordinary legacy of the Lincolns, we are helping them make sense of the troubling times in which we now find ourselves. “I will definitely incorporate [into my teaching] several of the primary sources and posters. […] Today’s institute was very informative and empowering. I will leave with a confidence to teach the rise of fascism and the Spanish Civil War with a variety of new lessons. The knowledge and delivery of information from the instructors was excellent.” –high school social studies teacher, 5 years experience. Cleveland, Ohio. 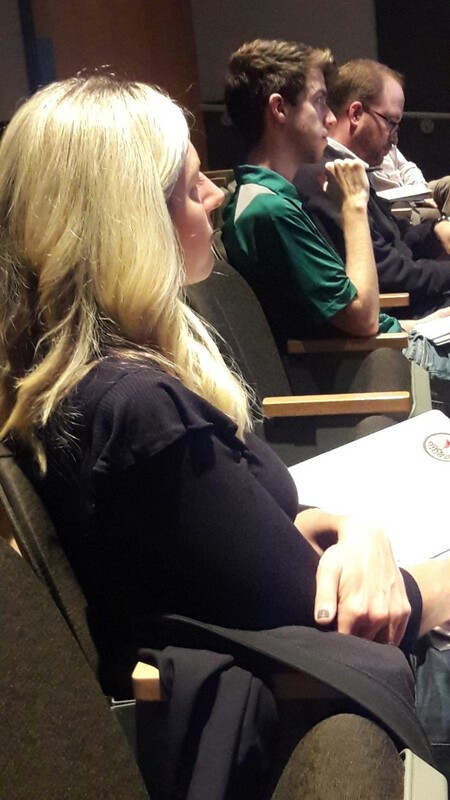 “This was by far one of the best professional workshops I have attended. It was well organized and the information invaluable to my teaching.” –high school teacher of Spanish language and culture, 20 years experience. Bowling Green, Ohio. It was exhilarating to help implement what the two of you provided for our teachers [at the Ohio Council for the Social Studies Conference in Cincinatti]. Things flowed seamlessly, we had a large crowd, teachers were in rapt attention and it showed up in the superlative evaluations you received. I was approached by one of our OCSS Board members who talked about how blown away she was by the quality of the session and the materials which you provided. She mentioned that she came to a brand new awareness of the importance of the Spanish Civil War and its interconnection with WWII and fascism. She just gushed appreciation. She felt much as I did two years ago when I first attended Peter’s session at OCSS. I am so happy to have had the opportunity to bring you and the ALBA materials to our teachers. September 24-26: Peter N. Carroll and Sebastiaan Faber present special workshop on professional development at the annual conference of the Ohio Council for the Social Studies in Cincinnati, Ohio. 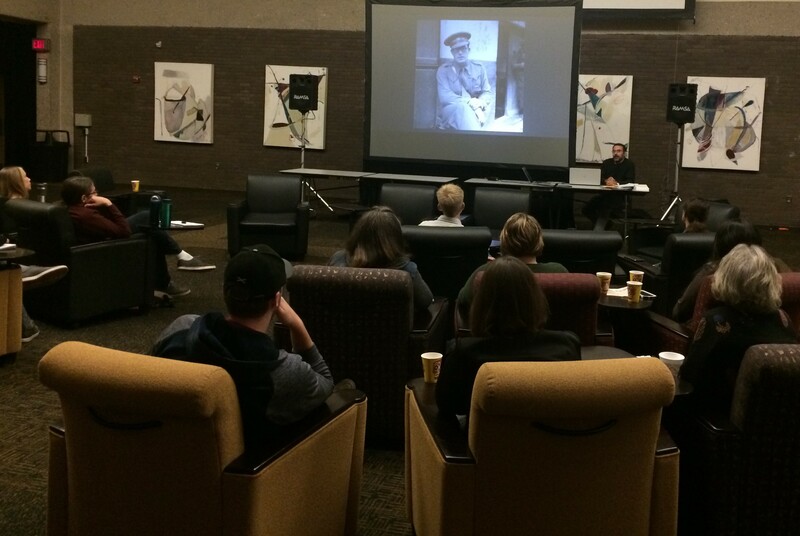 October 10: Carroll, Faber and James Lane co-teach a one-day workshop in Cleveland, Ohio, co-hosted by the Maltz Museum of Jewish Heritage. 10 participants. 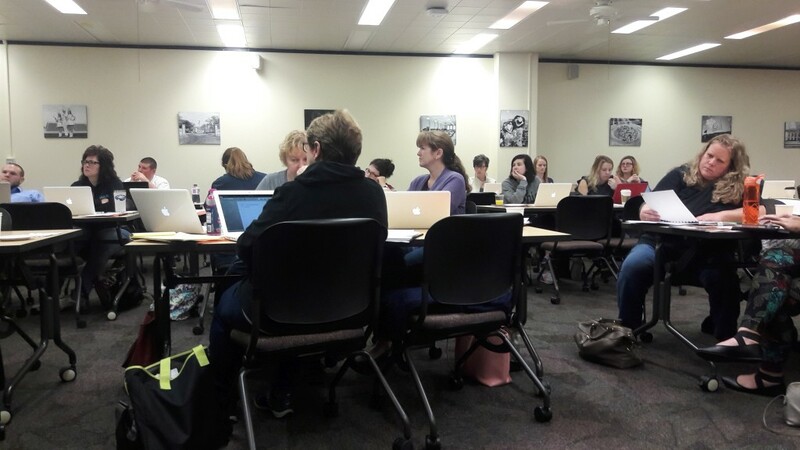 October 12: Carroll, Faber, and Lane co-teach a one-day workshop in Bowling Green, Ohio, co-hosted by Bowling Green State University. 33 participants. Followed by a discussion at the Bowling Green Public Library. October 17: Andrés Fernández Carrasco leads a class visit of 20 NYC high school seniors to the Tamiment Library, where they handle and analyze posters from the Spanish Civil War. 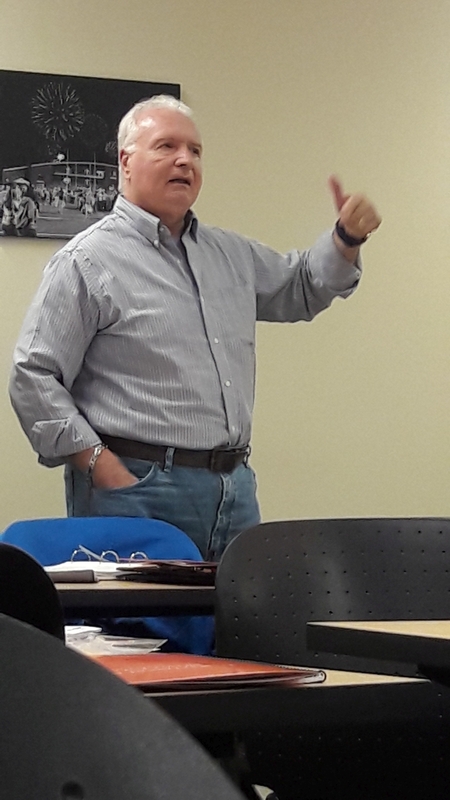 October 18: James D. Fernández and Juan Salas co-teach a one-day workshop in Milwaukee, Wisconsin., co-hosted by the School of Education and the Department of History at the University of Wisconsin-Milwaukee (UWM). 16 participants. November 7: Carroll, Fernández and María Hernández-Ojeda co-teach a one-day workshop for high school educators in New York City, co-hosted by NYU, and sponsored, in part, by funds provided by the NYC Department of Cultural Affairs (DCA). 55 participants. 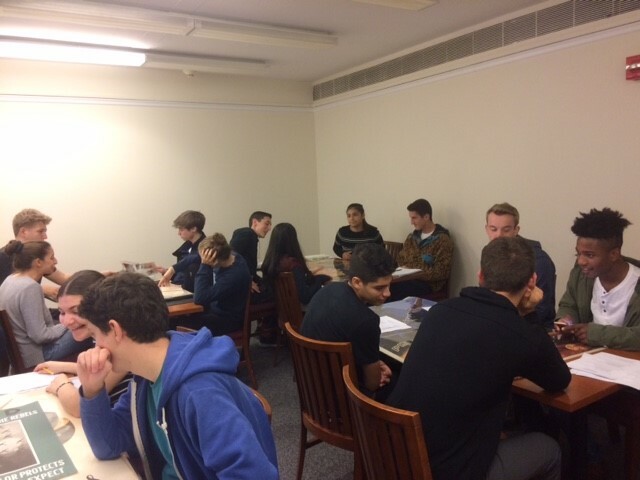 November 17: James D. Fernández leads a class visit of 16 NJ high schoolers to the Tamiment Library, where they handle and analyze letters and other artifacts from the Spanish Civil War. TBD, two-day workshop in Eastern Massachusetts; co-sponsored by the Collaborative for Educational Services. TBD, three-day workshop in New York City, NY; co-sponsored by NYU and funded, in party, by funds provided by the NYC Department of Cultural Affairs (DCA).